Whether you a want juicy steak, or grilled lobster Ediths Restaurant in Cabo San Lucas caters for all tastes. Eating at Edith's at an early part of your vacation is recommended. This gives you another chance to try out some more of their food if you have the time. 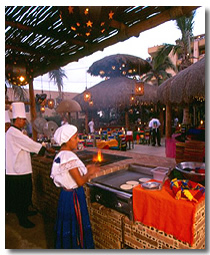 All these dishes can be enjoyed outside, with the ocean in view, in the Cabo San Lucas evening air. The band playing their acoustic melodies in the background add even more of that Cabo ambience to your dining experience. Although it's not a necessity making a reservation at Ediths Restaurant in Cabo San Lucas will be in your favor. Being popular all year round, and only open for about 6 hours an evening you will want to guarantee your table. If you are going with a large group, then a reservation is recommended. You have the option to make your reservation online before you go. The atmosphere at Edith's is fantastic. Watching the chefs cooking your meal while you are sitting at your candlelit table puts you in the right mood. You'll enjoy a meal to remember at Ediths Restaurant in Cabo San Lucas. If you have a hunger for seafood or traditional Mexican food your appetite will be satisfied.